After what seems a long ” summer ” period with the main pond deserted, or almost deserted , it is nice to have a few birds swimming about ! The two Mute swans that I mentioned a few days ago that my wife’s photo here shows, as well as our solitary juvenile Moorhen, still puzzled as to why it’s parents left ? and we have also had a hand full of Mallards visiting of and on. So something at least to watch !! Being a wee bit incapacitated by having tweaked my back the other day 😦 I sat down to catch up with some of the very basic statistical analysis that I do of the daily bird sightings that we record. It is so basic that all it amounts to is collating the daily average for each month as it is completed ! We began to do this in 1992 which, if my mental arithmetic serves amounts to exactly 20 years of records ! which might be of not much practical use to anyone but is at least interesting to us to look back on. The monthly averages are recorded on a year by year basis and it is this monthly average comparison that I have just had a quick look at and it IS interesting . The January average for this year was, at 15.03 species per day , the equal best ever for this month, a direct consequence of a more intensive feeding regime maybe, but, at least also in part due to the maturing of various tree and shrub planting which provides both more cover and food. It was our best February ever over these 20 years with a daily average of 17.35 which compared to the previous best February average of 15.46. Nearly an extra 2 species a day is quite a jump. Reasons as mentioned above I imagine. March , April and May averages were pretty much typical for these months over the years, though there have been peaks and troughs as you would imagine. We had the third worst ever June with a figure of 16.43. Compare this to the fact that the two best ever monthly averages over the two decades were both June months with figures of 30.13 in 1996 and 28.50 in 1997. The difference is huge and can only in part be put down to the poor weather through this so-called summer ! 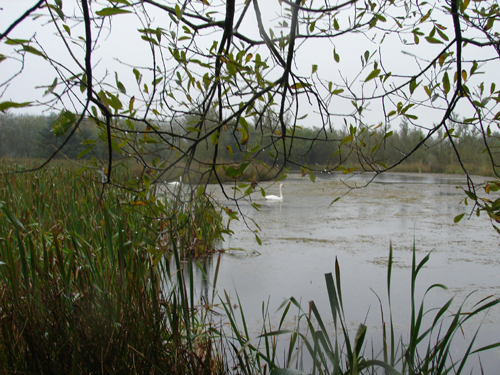 The water birds normally associated with a successful breeding season on the main pond were seriously affected by the visit of Otters during the critical period. There are definitely other factors that impinge on this dramatic difference in averages which I would like to discuss here at a different time. As in June the July figure was the third worst ever, same factors apply ! We have just had a fairly normal August for bird numbers. As I said at the start it may be that these figures are of interest to only ourselves as long-term occupiers of the land. 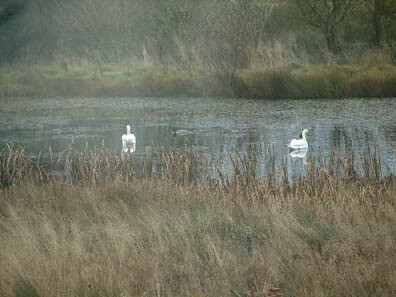 The records relate to bird species that are recorded either by sight or by sound as being anywhere on or above the Willowbog Farm area. 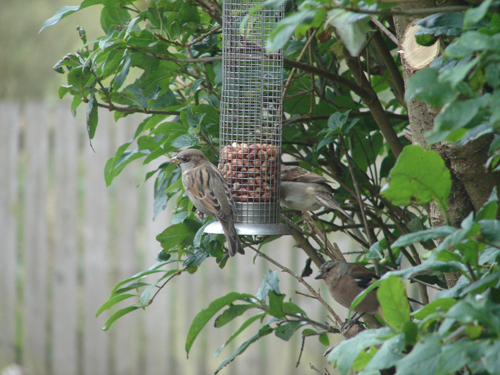 Every year on just a few occasions a few of these birds visit the peanut feeders in our garden. 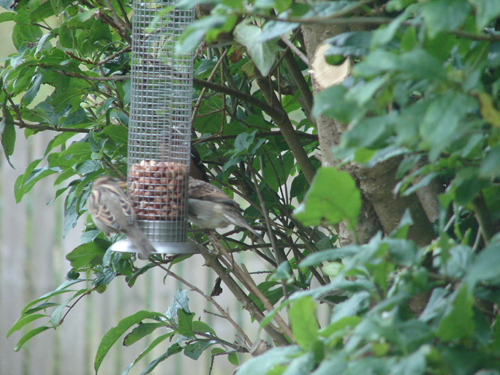 Although these two rudely have their backs to the camera, you can just make out that they are House sparrows !! Though , of course, not really rare [ though not as common as they once were I think ] for some reason we do not see them very often. At the village of Stonehaugh, only about half a mile away as the sparrow flies, there always seems to be plenty about , when we see them, this species always merits a comment between my good lady and me . And they are still with us this morning , no way of knowing if they are the same two that we see from time to time , but nice to see anyway. Following the devastating visit by Otters earlier in the year, the pond has been very quiet , in fact just one juvenile Moorhen to be seen !